It’s time to get as silly as possible. Let’s dig down into the world of great food puns. 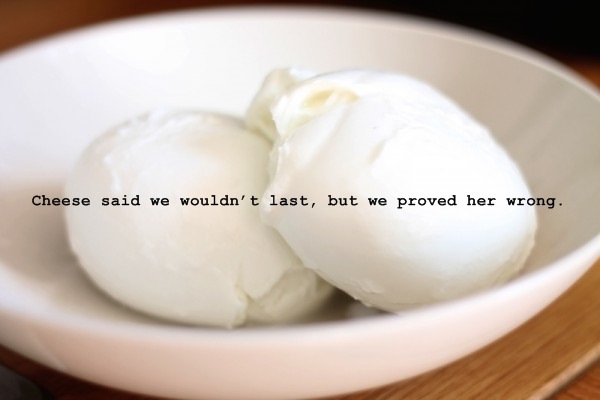 I collected a 100+ list of great food puns and a few not so great you’ll be the judge. Let’s just kick this thing off, let’s check out some food puns. To make it a little bit easier to navigate through this list you’ll find the puns sorted into categories below, enjoy! It was really nice to meat you. I have an idea for a chain of Elvis Presley steak houses. It will be for people who love meat tender. My friend told me they were turning vegan. I said, “That’s a big missed steak”. I bet the butcher $500 he couldn’t reach the steaks on the top shelf. He said the steaks were too high. Do cannibals like to meat people? 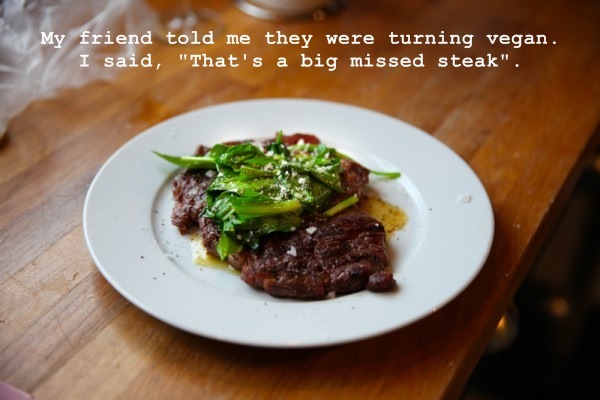 If you believe restaurants always overcook steaks, then you probably order them rarely. Salami get this straight: do you love me? Do butchers link sausages to make ends meat? Smoking will kill you. Bacon will kill you. But smoking bacon will cure it. Being without you is the wurst. My sister bet me I couldn’t build a car out of spaghetti. 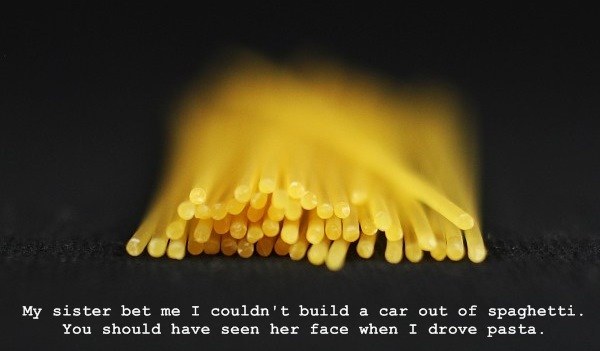 You should have seen her face when I drove pasta. Did you hear about the elderly Italian chef? He pasta way. What do you call a fake noodle? A. An impasta. I burnt my Hawaiian pizza today. I think I should have cooked it on aloha temperature. You’re a real pizza work! I went to a seafood party last week. I pulled a mussel. How do you tuna fish? Adjust their scales. Stop it, you’re being too being too shellfish. I’m hooked on eating fish. What did the fish say when it ran into a wall? Dam. I love fish but I think I need to scale back. What did the boss say to his employee? Cod I borrow you for five minutes? Cheese is grate for you. Cheese said we wouldn’t last, but we proved her wrong. We go really gouda together. What do you call cheese that is sad? A: Blue cheese. To brie or not to brie. After the explosion at the cheese factory, there was nothing but debrie. I am not yolking when I say you are the very best. A boiled egg in the morning sure is hard to beat. Ah, you crack me up. Your yolks crack me up. I threw my toaster away because it kept burning my bread. You could say I’m black toast intolerant. My friend asked me how I bake my bread. I said I couldn’t tell him because it was on a knead to know basis. I should just stop loafing around. Radical bakers are always against the grain. We are mint to be. I decided I was going to grow some herbs …But I couldn’t find the thyme. Our love is kind of a big dill. Thyme stands still when I am with you. I’ve given up drinking coffee.It was giving me a latte problems. 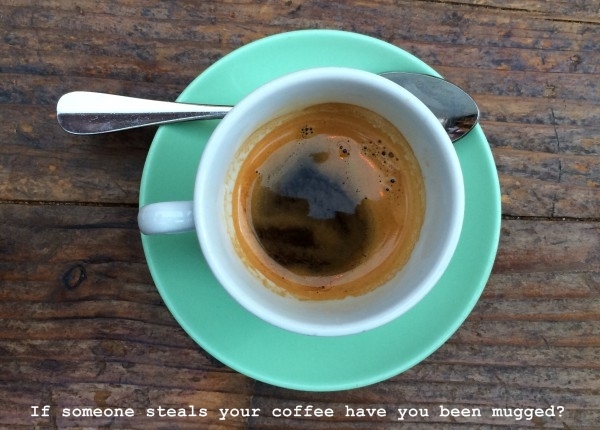 If someone steals your coffee have you been mugged? Spending a lot of time at the coffee bar can cause a latte problems. We are a matcha made in heaven. Move Oolong, nothing to tea here. Words cannot espresso how much you bean to me. You will always be my butter half. Some guy just threw milk and cheese at me. How dairy! Why does yogurt love going to museums? Because it’s cultured. A guy just threw a glass of milk at me. How dairy! When making butter there is little margarine for error. You’ve got a peas of my heart. I have bean thinking a lot about you. Here’s my number, so kale me maybe? What do you call a runaway pea? An esca-pea. My heart beets when I think of you. There is mushroom in my heart for your love. I don’t carrot all about others, just you. Romaine calm! We’ll be just fine. How much room should you give fungi to grow? As mushroom as possible. What do you call a round, green vegetable that breaks out of prison? A. An escapea. I can’t stand potato puns. I think they’re pomme de terrible. Which type of vegetable tries to be cool, but is only partly successful at it? The radish. My love is pho real. You always make miso happy. 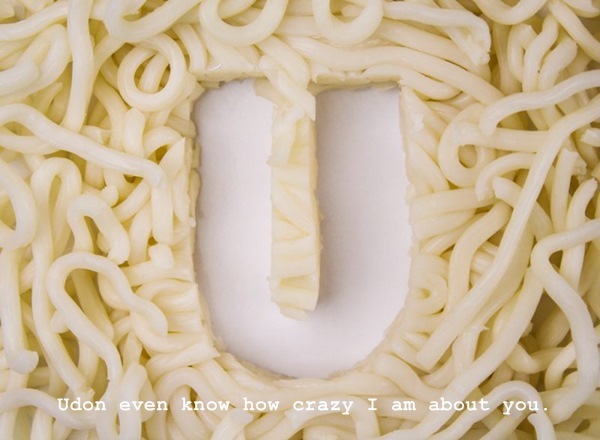 Udon even know how crazy I am about you. My friend fell into a vat of curry. He’s in a korma. Curry home, I miss you. Did you hear the news about that Chinese restaurant that got vandalized? It was an act of wonton destruction. I am your biggest flan. I went to a wedding at the weekend.It was very emotional. Even the cake was in tiers. Muffin compares to your love. I cannoli think of you and no one else. Thanks for pudding up with me. I dig you a waffle lot. My girlfriend quit her job at the doughnut factory because she was fed up of the hole business. I did a grape job choosing you. I am berry excited to spend my life with you. I get melon-coly when I am not with you. What does a grape say when it gets stepped on? Nothing, it just lets out a little wine. 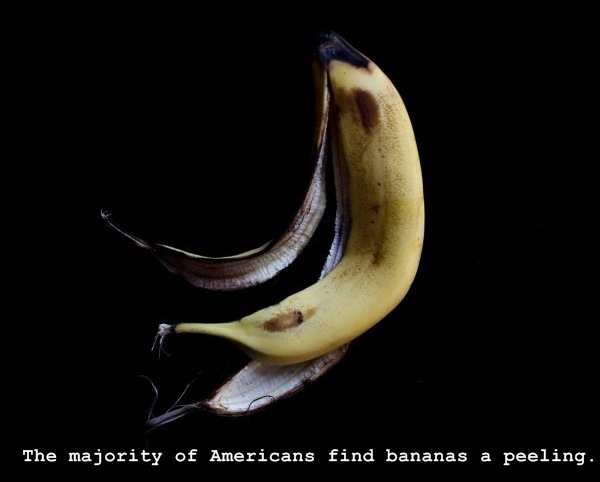 The majority of Americans find bananas a peeling. Why did the apricot ask a prune to dinner? Because he couldn’t find a date. I’m so grapeful for you. What do computers eat for a snack? Microchips. I love you very mochi. Ice cream my love for you wherever I go. The s’more I know you, the s’more I love you. I love candy canes when they’re in mint condition. You occu-pie every single one of my thoughts. 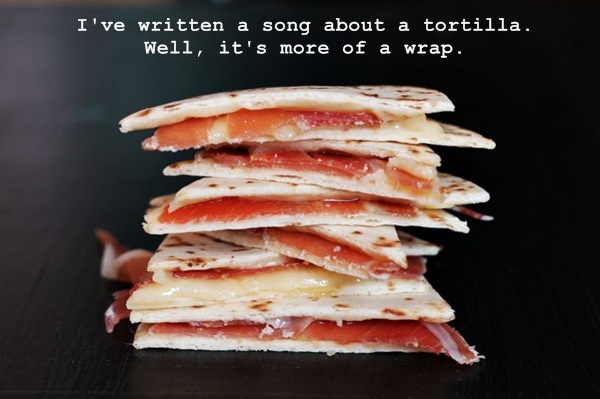 I’ve written a song about a tortilla. Well, it’s more of a wrap. If two vegetarians are arguing, do they still have a beef with each other? Boy, I just got hit in the head with a can of soda. I was lucky it was a soft drink. This girl said she recognized me from the vegetarian club but I’ve never seen herbivore. The Three Little Pigs order off the vegan menu, but Mary Had a Little Lamb. You and me? Let’s taco’ bout it. How do you keep intruders out of a castle made of cheese? Moatzarella. Did you hear the one about the guy who invented Tic Tacs? They say he made a mint. Every morning I think I’m going to make pancakes, but I keep waffling. Why couldn’t the sesame seed leave the poker table? Because he was on a roll. Why do hamburgers go to the gym? To get better buns. Did you hear the one about the greedy peanut butter? I’m not telling you. You might spread it. Is your body from McDonald’s, because I’m lovin it!